We all make bad choices every day. Many of them take a direct hit on our finances. Stop flushing your money down the proverbial toilet, and put an end to these money-wasting habits. You ate out for the third time this week. According to the USDA, over 30% of meals are eaten away from home. We’re not saying to skip dining out altogether, but do make an effort to cut back your trips to the takeout counter and get more creative. Not crazy about cooking? Look up recipes that can last more than one night. For example, roast a chicken one night and make fancy chicken sandwiches with arugula and honey mustard two nights later. Make burgers and baked fries on Tuesday and then use the hamburger meat to make tacos on Thursday. If you do order out, put half of it aside for later in the week. Also see our primer on grocery shopping on a budget. You got the super-size latte with foam and a 50 cent shot of espresso. If you spend around $5 on coffee or latte (and many spend more) just three days a week, it can add up to over $700 per year. If it’s your daily habit, it could easily cost you more than $1,000 annually. We won’t bore you by telling you to make your own coffee and drag a thermos to work. Instead, pitch in with your coworkers to buy a fancy coffee machine and take turns as the office barista. You paid just the minimum due on your credit card bill, again. It’s so tempting, we get it. The credit card bill has a much smaller number next to your full balance, and you feel strapped for cash. Resist the urge to pay only the minimum balance each month, and take a harder look at how much you can really put toward your bills. Those interest charges are just going to continue to climb. And when you do pay off your bills, you’ll be able to reap rewards. You drove at 80 mph to get to work. You know a lead foot leads to wasted gas, so why do you do it? Slow down and ride closer to the speed limit to minimize your commuting costs. 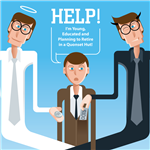 Look at your other monthly expenditures tied to your way to work that could be lowered. Could you park farther away, at a cheaper lot? Is it more economical to ride the bus, even if you do it just twice a week? Could you possibly bike or walk? If you still can’t resist the driving so quickly, then at least look into seeing whether the rewards from a gas credit card could offset your heavy right foot. You drank half a bottle of wine and it’s only Wednesday. If you smoke or drink, not only will your health take a hit, but your wallet will too. The USDA says that that people in the U.S. spend about 2% of their total expenditures on tobacco and alcohol, which adds up to over $700 on average. If teetotaling just isn’t your thing, then think about cutting back to only the weekends. You chose plastic – bottled water that is. You don’t need to be a math whiz to realize that spending $1 to $2 on each bottle of water is quite pricey. There are many home filters on the market, with technology ranging from carbon filtration to steam distillation. Find independent comparison data on different brands. Then, carry your water to the office in an eye-catching BPA-free bottle. You were too lazy to cut out a coupon. There are two ways to use coupons—either for stuff you need and buy regularly—or as an opportunity to try something new that you probably won’t use. The latter leads to impulse buys. But the former is worth taking the time to do. Sign up for updates, by email or through social media, only for your most favorite brands. And take a moment to grab the flier at the front of the grocery store before you start shopping. Coupons may feel quaint, but if you’re savvy about which ones you use, you could realize hefty savings. You let your belly rumblings prod you to the vending machine. You spent half an hour reading about things you already know. Buying magazines on impulse at the checkout corner is a waste. You were probably won over by a sensational headline about a topic you’ve already read about 20 times. Stick to only your favorite publications and subscribe to them during a fundraising event or through your tablet for cheaper subscriptions. Another option is to go to your local library as they likely have most of your magazines there that you can browse anytime. You lied when your spouse asked about the last time you got an oil change. How conscientious are you about little decisions you make each day? Do you reach for healthy snacks instead of potato chips? Does your car and home receive scheduled maintenance? 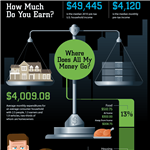 Taking care of yourself and your valuable assets could save you money on everything from healthcare to major repairs. 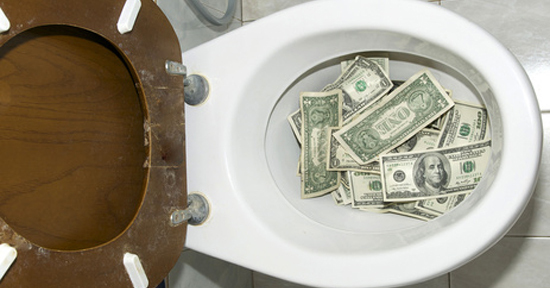 Leave a comment about 10 Ways You Flushed Money Down the Toilet Today? Share on Facebook "10 Ways You Flushed Money Down the Toilet Today"